LEAVING BERLIN by Joseph Kanon is a gripping historical thriller. The book’s plot takes place in Berlin four years after the end of World War II. What makes this novel special is that through an action-packed plot readers gain a glimpse of what it was like at the start of the Cold War, where the Stalinists replaced the Nazis. In many ways it is so realistic people will forget it is a thriller. The story line is based on the adventures of Alex Meier, a German whose father was Jewish and who sees himself as a socialist. With the help of his family he escaped to America before the Holocaust. Although he did not have his heart with the Communists he still was swept up by the McCarthy era after refusing to name names to a Congressional committee. To avoid jail and wanting to continue being a celebrity novelist he makes a desperate deal with the CIA. He must return to Berlin, pose as a disenchanted exile, and gather actionable intelligence by spying on a former lover. Alex finds that espionage in Berlin is a fact of life. Throughout the story Kanon shows the characters to be unlikely spies. There are some scenes that might suspend belief as Alex suddenly develops into a master manipulator and is able to handle violence with self-confidence. He is an amazingly fast learner in the art of spy craft, but without this the thriller would be lacking in suspense. Kanon sets the tone for the readers in the very first pages as he explains in an author’s note about the setting and the various organizations that played a key role in the story. Readers learn through the main female character, Irene, about the double-dealing that is done to survive by working with the different secret organizations. Another character to survive is her brother-in-law, an unapologetic Nazi doctor who worked for the Third Reich’s euthanasia program. 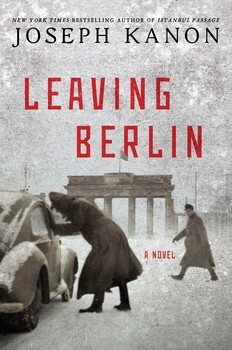 Leaving Berlin is about betrayal, murder, and survival. It is filled with intrigue that reminds readers of a period and place where loyalties were conflicted and political maneuvering was prevalent. This is a must read for its complex, riveting, and intricate plot.